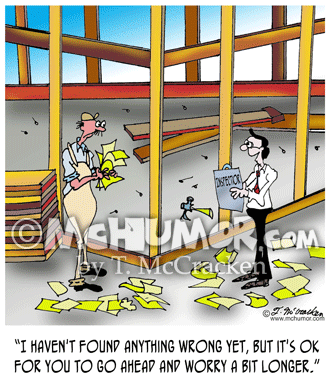 Inspection Cartoon 6100: A building inspector saying, "I haven't found anything wrong yet, but it's OK for you to go ahead and worry a bit longer." 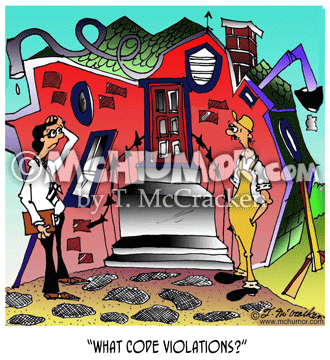 Construction Cartoon 8161: A contractor in front of a building that's lopsided and has obvious problems saying to an inspector, "What code violations?" 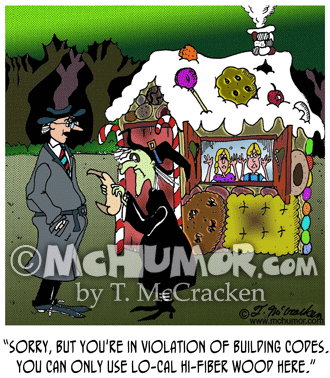 Construction Cartoon 4914: An inspector saying to a witch in front of a gingerbread house: "Sorry, but you're in violation of building codes. 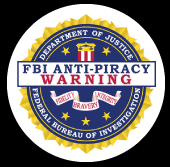 You can only use lo-cal hi-fiber wood here." 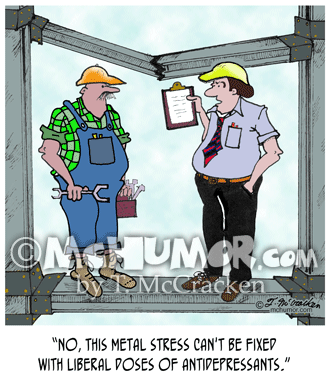 Construction Cartoon 1941: At a construction site with a cracked beam an inspector says, "No, this metal stress can't be fixed with liberal doses of antidepressants." 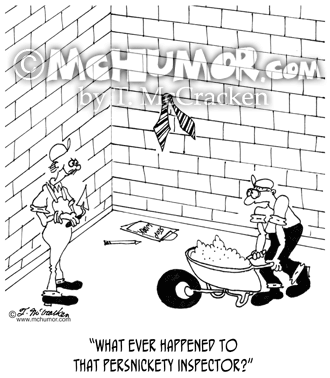 Inspector Cartoon 6430: Not seeing a tie cemented in a wall a man asks a brick layer asks, "What ever happened to that persnickety inspector?" 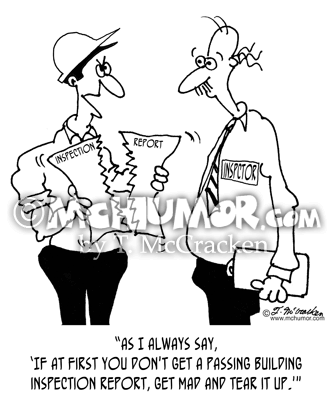 Inspection Cartoon 6133: A contractor tearing up an inspection report says, "As I always say, 'If at first you don't get a passing building inspection report, get mad and tear it up.'" 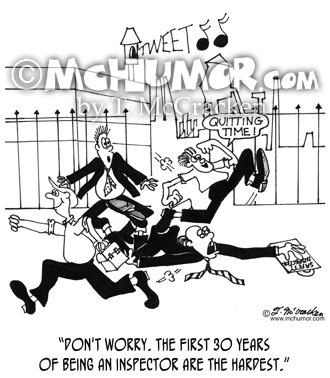 Inspector Cartoon 7331: At a site where inspectors are being run over by construction workers, an older inspector says to a young one, "Don't worry. 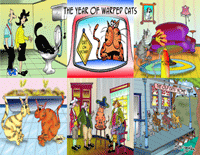 The first 30 years of being an inspector are the hardest." 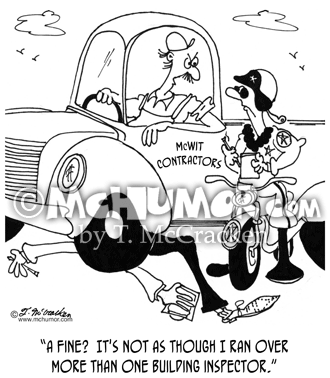 Inspection Cartoon 6349: A contractor says to a cop, "A fine? It's not as though I ran over more than one building inspector." 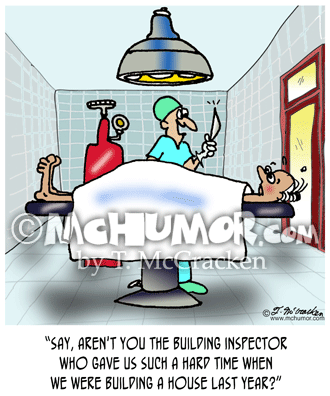 Inspector Cartoon 6310: A surgeon with a vast scalpel says to a terrified patient, "Say, aren't you the building inspector who gave us such a hard time when we were building a house last year?" 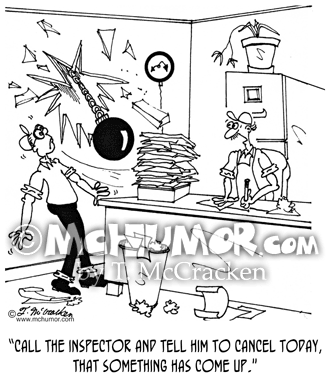 Inspector Cartoon 7332: Seeing a wrecking ball coming through the window of a building a contractor says to another, "Call the inspector and tell him to cancel today, that something has come up."